In Apr-2014, Ryanair will open bases number 63 and 64 at Athens and Thessaloniki, bringing its total in Greece to three (Chania was the first). With eight new routes, including a 36 times weekly Athens-Thessaloniki service, Ryanair’s Apr-2014 seat capacity in the country looks like being around 50% higher than in Apr-2013. For Greece’s leading airline group Aegean (which now includes Olympic Air), perhaps the most significant and worrying elements of Ryanair’s Greek expansion are that it is moving into the latter’s Athens stronghold and that it is increasing its domestic Greek activities. Only months after the European Commission approved the Aegean acquisition of Olympic, partly on the grounds that no competitors were likely to enter routes where they operated a duopoly, Ryanair is going head to head on four of Aegean’s top 10 domestic routes (including one former duopoly route). Why is Ryanair targeting Greece for such strong growth and what might this mean for Aegean’s future profitability just as a return to profit comes into view after three years of losses? At Athens, where Ryanair previously did not operate, it will base two of its Boeing 737-800 aircraft and open six new routes (London Stansted, Milan Bergamo, Chania, Paphos, Rhodes and Thessaloniki). At Thessaloniki, where Ryanair already operated 13 routes, it will base one aircraft and open three new routes (Athens, Pisa and Warsaw). Ryanair will operate to/from a total of eleven cities in Greece after Apr-2014, when it will have four domestic Greek routes, three of these from its new Athens base. Aegean serves eight Greek cities. Ryanair’s two new bases, Athens and Thessaloniki, are respectively Aegean’s number one and number two airports by seat capacity. Chania, already a Ryanair base, is Aegean’s sixth largest. Aegean is the number one carrier at Athens, where LCC penetration has remained relatively low until now. Together with Olympic, the Greek carrier has 62% of seats at Athens. EasyJet is currently the largest LCC at Athens, with less than 3% of seats at the airport (week of 20-Jan-2013, source: OAG), although this share is more than 3% in the summer schedule. We calculate that Ryanair’s six new routes, involving 154 weekly flights, equate to around 29,000 weekly seats. This is close to one quarter of Aegean’s capacity at Athens at the start of Apr-2013 (source: Innovata) and represents a significant competitive onslaught. 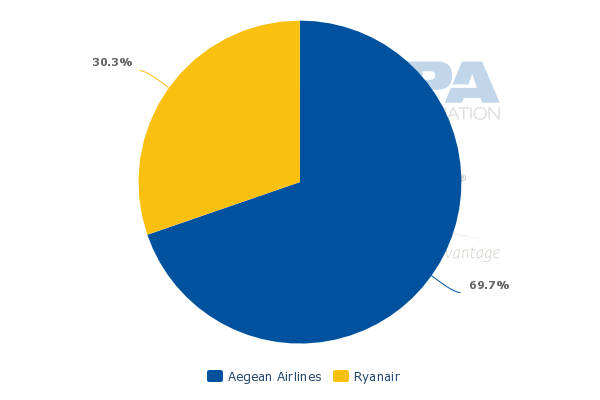 At Thessaloniki, Aegean has almost 64% of seats, with Ryanair the second largest carrier on 17%. Ryanair’s three new routes, which include the 36 times weekly (in either direction) route to Athens, will add around 15,000 weekly seats. 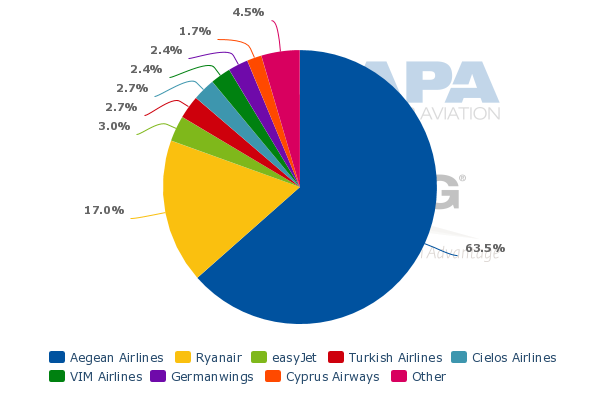 This is around 38% of Aegean’s Apr-2013 weekly capacity at the airport, again representing a major increase in competition. At Chania, Ryanair’s existing base, capacity is currently split 70:30 between Aegean and Ryanair. The new 13 times weekly (in either direction) Ryanair service to Athens is equivalent to around 4,900 seats, or 64% of Aegean’s Apr-2013 capacity at the airport, according to our calculations. Aegean Airlines operates on all six of the routes that Ryanair will launch from Athens (if viewed on a city pair basis – Aegean operates Athens to London Heathrow). In addition, easyJet and British Airways also operate Athens to London and easyJet operates Athens to Milan (Malpensa). These routes are significant for Aegean. In particular, Athens to London and Milan are among Aegean’s top 10 international routes by seats and the addition of Ryanair as a competitor on these city pairs represents a significant increase in the intensity of competition it faces. The four domestic Greek routes Ryanair will be operating from Apr-2014 (including one already operated) are all in Aegean’s top 10 domestic routes. Thessaloniki to Athens is Aegean’s biggest domestic route by seat capacity, Athens-Rhodes its number three domestic route, Athens-Chania its number four and Thessaloniki-Chania (where Ryanair is already present) its number 10. Significant new competition in the domestic market, eroding the Aegean group’s near monopoly, could also eventually undermine its international network, which needs domestic feed. Aegean and Olympic have a combined share of 90% of domestic seats in Greece, a factor that was instrumental in the logic behind their merger since demand was not strong enough to sustain their profitability. Olympic has 80% of its seats in the domestic market and was the only significant competitor to Aegean before the merger. The European Commission approved the deal in Oct-2013 on the grounds that Olympic would have collapsed otherwise and that no other competitors were likely to enter the five domestic routes where the two operated a duopoly. Already, the EC has been proven wrong in this respect. One of the five duopoly routes identified by the Commission was Athens to Chania, a route on which Olympic has now ceased to operate and where Ryanair will launch with a 13 times weekly service in Apr-2014. This is the same frequency that Olympic used to operate with 78-seat Bombardier Dash-8 turboprops on the route, but Ryanair uses 189-seat Boeing 737-800s. This will give Ryanair around two and a half times the weekly seat capacity that Olympic had on the route. Meanwhile, Aegean has, in effect, absorbed the capacity that Olympic gave up on this route. By Jul-2014, Aegean will have around 4,000 seats and Ryanair will have around 2,500, making a total of 6,500 on the route. This compares with Jul-2013, when Aegean had around 3,500 and Olympic around 1,000, giving a total in the region of 4,500 seats. Aegean has been growing and Olympic was shrinking on the route. In Jul-2012, the figures were around 3,400, 1,900 and 4,300 for Aegean, Olympic and the total respectively. Ryanair is now making a very significant contribution to growing total market capacity on the route. Ryanair is also entering with very low fares. Its website currently offers outbound (and return) Athens to Chania sectors starting at EUR11.99 in its first week of operation. This compares with Aegean’s lowest price that week of EUR49.64. While extrapolating firm conclusions from single data points can be dangerous and Ryanair’s prices range up to EUR45 during the month of Apr-2014, it does seem that its tactics are to launch with a flood of capacity and very low fares. This will present Aegean with a significant challenge. Why is Ryanair targeting Greece? The additional capacity to be added by Ryanair on the new routes in Apr-2014 is roughly equivalent to half of the total capacity it had in Greece in Apr-2013. This follows growth of almost 20% in Ryanair’s seats in Greece in northern summer 2013 versus summer 2012. Why is Ryanair now making Greece such a priority for growth? 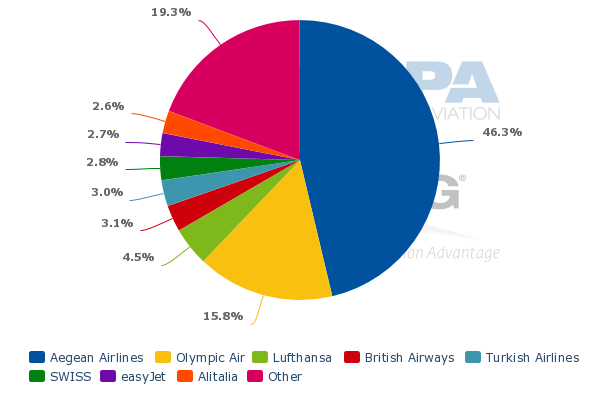 At the start of the northern summer 2013 schedule, Ryanair had around 14% of all seats across the markets in which it operates (source: CAPA analysis of data from Innovata for the week of 19-Apr-2013). By country, this share varied widely, from 1% in the Czech Republic to 74% in neighbouring Slovakia. Among the large European countries, its share was higher than its 14% average in the UK, Spain and Italy and below this level in France and Germany. It has seen some growth in Germany since then, while facing ongoing constraints in France. In Greece, its share of seats was around 11%, below its network average. Below the top five European country markets (UK, Germany, Spain, France and Italy), the largest Ryanair markets where its share was below its 14% average at the start of summer 2013 were the Netherlands, the Scandinavian countries, Austria and Greece. The size of the Netherlands market is boosted by the importance of the long-haul connections served from Amsterdam Schiphol, whose relatively high charges are likely to continue to deter Ryanair from making this country a priority for growth. While it has pursued growth in the Scandinavian countries, Austria is also unlikely to be a priority due to high airport charges. So, although Greece is not one of the largest markets in Europe, it is next on the list for attention from Ryanair and its decision to add two new bases there is not surprising. It has the right combination of sufficient size and relative under-penetration by Ryanair. Moreover, Greece is a strongly leisure-oriented market and this suits Ryanair. For all its talk about targeting business passengers, the core of Ryanair’s operation is likely to remain the leisure flyer. It needs to continue to find growth opportunities ahead of the new aircraft deliveries under its new Boeing order and Greece seems to fit. Ryanair’s new customer-friendly approach. Really? Ryanair may also see Greece as having the added attraction of a local operator that is relatively small and vulnerable. Based on 2012 figures (the nearest financial year), Ryanair’s operating cost per passenger of EUR53 is less than half that of Aegean’s EUR109. Aegean’s 9M2013 results saw it on course for a return to profit after three years of losses. However, any further increase in head to head competition with Ryanair on point to point routes, especially in the domestic market, seems likely to lead to more pain for Aegean. As for Ryanair, its aggressive capacity growth and price discounting may lead to some short term erosion of profitability, but it has sufficiently high margins and cash reserves to sustain this without much trouble.